On most tours musicians just play music for their fans. But this time, IFEEL is taking his tour a step further: he will perform his music and inspire his fans to feel good. This vegan rapper and fitness trainer is embarking on a different kind of tour. He will be playing his music, inspiring people to get active and helping animals at the same time. IFEEL’s tour consists of IFEEL GOOD PARTIES in 20 major European cities – in 14 countries – from October 19 until December 19. Those parties will include talks about health and wellness, exercise, cooking, compassion and, of course, a concert. And instead of doing them in public venues, they will be private events, and will take place where IFEEL can have the best connection and positive impact - in his fans’ homes. His fans can currently apply to host an IFEEL GOOD PARTY in their home, where they will have an opportunity to invite their closest friends for a private event with IFEEL. In every city of his tour, in addition to IFEEL GOOD PARTIES, IFEEL will be doing healthy, fit flash mobs to inspire people to get active and start feeling good in a fun, positive way. While on tour, IFEEL will let his fans and supporters of his campaign follow each and every step of the tour online and will share all the feel-good tips and tricks, recipes, exercises and music with them. Inspired by the events and people on his tour, IFEEL will record a song and shoot a music video on the road. 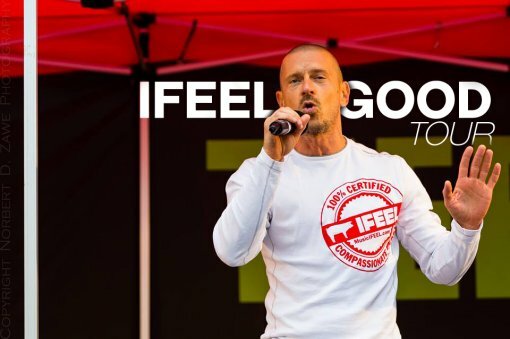 As a rapper that makes music to give animals a voice, IFEEL is known for his compassionate voice for animals and has performed at all major European vegan festivals. IFEEL will perform at the birthplace of the first vegan Oktoberfest in the world – in Munich, Germany on September 30, where he will officially announce his IFEEL GOOD TOUR. Vegan movement is on the rise as more people are getting informed about animal abuse and benefits of plant-based lifestyle for health, animals and planet. But there is a problem: there are a lot of misconceptions and questions about a vegan lifestyle. Ljubljana (October 19-22), Munich (October 22-25), Vienna (October 25-28) Bratislava (October 28-31), Praha (October 31 - November 3), Berlin (November 3-6), Hamburg (November 6-9), Copenhagen (November 9-12), Amsterdam (November 12-15), Brussels (November 15-18), London (November 18-21), Brighton (November 21-24), Paris (November 24-27), Toulouse (November 27-30), Madrid (November 30 - December 3), Barcelona (December 3-6), Nice (December 6-9), Torino (December 9-12), Zurich (December 12-15), Milano (December 15-18), Zagreb on December 19.